When you’re preparing to go out for a day hike, whether it’s an easy mile or a more strenuous 8-mile hike, taking enough (and the right) snacks to keep your energy levels up is a priority. Sure, we all know how important it is to bring along the proper amount of water for hydration, but when you’re burning up the calories trekking around, you need to have enough sustenance to keep yourself going. After a few mishaps where I didn’t pack enough food, I now have some staple items that I toss in a daypack and a cooler in the car in order to ensure that I don’t get too hungry out there. 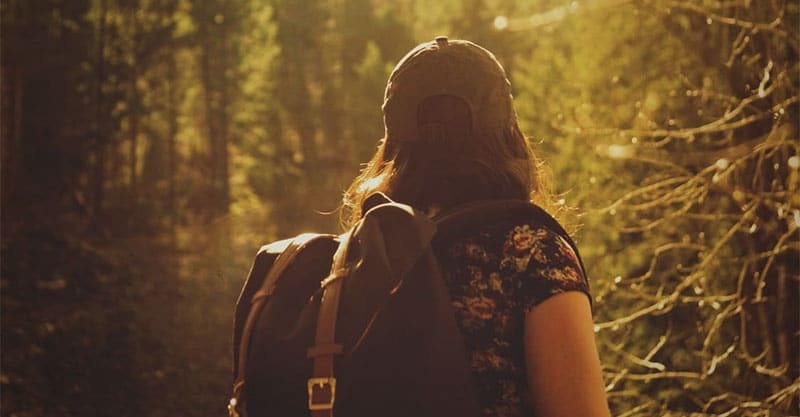 If you’re looking for some ideas on what to pack for your next day hike, check out my list below and see if you can’t get some inspiration on some tasty snacks to prepare for your next hike. 6. Something sugary for when I need an energy boost. Definitely one of my go-to snacks is almonds. In a pinch I’ll take peanuts, but pretty much any type of nut is a good choice. Why? They’re good for you, the fiber content means they fill you up quickly, and they give you energy. EMS has a short and to the point little guide on nuts & seeds for hikers – check it out here. The only negative to packing some almonds or other nuts is that they can get heavy if you pack too many of them. The sandwich that I take on pretty much every single hike is a PB&J – and not because I want a throwback to childhood, but because it is the perfect hiker’s snack. You get all the benefits from nuts in your peanut butter, a quick energy boost from the sugar in the jam, and the carbs in the bread also give you a shot of energy. Plus, PB&J’s are pretty filling for a sandwich. Round it out with some apple slices and you’ve had an awesome lunch to carry you through the rest of your hike! As an alternative, you can take some of those packets of Justin’s Nut Butter (maple almond is my fave!) with some whole wheat crackers. Though I usually try to bring a banana or apple, I’m also a big fan of dried apricots when I go on hikes. Despite being high in sugar content, dried fruit is healthier than eating energy chews or something else for an energy boost. But my #1 reason for bringing dried apricots is that they are high in potassium, which is perfect if you tend to get foot cramps (like me) after being out for a while. Plus, they just taste good with almonds (which are also high in potassium!). Sometimes, I bring some tinned tuna on my hikes instead of a PB&J. I don’t like to do this if I’ll be having lunch out on the trail since can weighs more. However, if I expect to have lunch or dinner back at the car, then this is what I’ll leave for when I return from the hike. You can also buy tuna in a little pouch, but I don’t recommend that since they put in a bunch of fillers (like soy). Instead, look for something that is just tuna and water, or tuna and oil. I’m a big fan of the canned tuna at Trader Joe’s – plus it’s cheap! Just remember to bring a can opener with you, unless you buy a brand with a flip-top lid. And, I prefer to have some whole grain crackers, instead of bread, to enjoy with my tuna. Right now, I’m a big fan of the KIND brand of fruit and nut bars. Though they’re not organic, they are non-GMO, which is important to me. I also like that you can find several different options with just 5 grams of sugar, which is still enough to give you an energy boost out on the trail. The Dark Chocolate Nuts & Sea Salt bar is my current go-to option. If you give it a try, just remember that it does have chocolate in it, so it will melt if left in the direct sunlight, or in the front pocket of your daypack that’s getting hit by the sun’s rays. As you might have noticed if you saw my VSSL Cache review, I like to include a little something sweet in my food supply for those times when my feet start dragging on the trail. This can be anything from a pack of fruit snacks or fruit leather strips, to a chocolate bar to Honey Stinger energy chews. The fruit leather strips are actually some of my favorite things to include since they don’t take up much space and they are super cheap to buy at my local Whole Foods. And I think, though they are high in sugar, they are the healthier pick of the options. Unfortunately, I can’t always take these with me on hikes, but if I’m packing a cooler to leave in the car, then you can bet that there’s gonna be some hard-boiled eggs in there. These are easy to eat, full of nutritional goodness, and they fill you up pretty quickly. I prefer eating these both before and after a hike since the protein is good for both fueling and recharging the body after a hike. If you prefer healthy, whole foods for your snacks, like I do, then I suggest preparing a little baggie of carrot sticks that you can munch on whenever you start to feel a bit peckish. I really enjoy taking these along on hikes because you don’t have to worry about them spoiling and they don’t cause a mess like cucumber slices, etc. Plus, they’re just plain good for you. I know this isn’t really your conventional hiking food fare, but trust me – an avocado spread on some whole grain crackers is a great snack out on the trail. You can either pre-cut the avocado and then sprinkle it with lemon juice to prevent browning (and store in a baggie) or use your survival knife to cut it open (assuming you have a way to clean the knife – or just bring along a clean one). Avocados are packed with nutrients, including healthy fats, which makes them an awesome addition to your pack. Sometimes I eat my avocado with my canned tuna for an even better lunch break. Another healthy-ish sweet snack that’s great for hikes are fig cookies, like Fig Newtons. Since I prefer to eat organic, I can’t really buy these pre-packaged but instead have to make my own cookies or fig bars to take out on hikes. If you prefer to make your own as well, this is a pretty good recipe to follow. If it’s going to be cold out there on the trail, then a thermos of soup is an awesome option. The only downside here is that conventional food prep guidelines means that you can’t go more than a few hours without risking bacteria sprouting up in the soup. So, just know that in advance. Personally, I prefer a smooth soup, like what you get from using a soup maker like this at home, so that you can just drink the soup. But, if you get a chunky one, then you can probably end up with more calories for powering through that trek. Every hiker has their favorite type of seeds to take out on the trail, and for me it’s roasted and salted pumpkin seeds because they taste like popcorn! They’re also super good for you and easy to eat while on the move. And, they have a good amount of potassium in them, which is great for people who get foot cramps while hiking. I’ve tried sunflower seeds in the past, but just found them to be too much of a pain to deal with on hikes. And even when I’ve tried just sunflower kernels, I found that they were too small to deal with out there. But hey, pick whatever works for you! Though I’m definitely not a fan of it, meat jerky of any type is a great thing to take on hikes. It gives you a nice protein boost, doesn’t take up much space, and you don’t have to worry about it spoiling in your pack if you don’t eat it quick enough out there.